Photocopiers are a costly, yet essential, piece of office hardware. Even in these ever-more-digitised times, any business that’s any cop still needs to copy important documents, articles, letters and such like. For a quality business photocopier, you’re probably looking at something in the region of £750 to £30,000. But, when it comes to photocopier prices, how do you know whether or not you’re being ripped off? Is there a difference between a black and white or colour photocopy machine price, and are there any hidden costs lurking behind the initial investment? The following addresses these nagging questions, and more, so you can make the most informed decision possible and compare photocopier prices today. 01 | How much do photocopiers cost? 04 | Photocopiers: to buy or to lease? Basic photocopiers can come in at as little as £100 but these models will be predominantly suitable for smaller, home-based businesses. On the other end of the spectrum, there are the industrial all-singing-all-dancing photocopiers reaching upwards of £20,000 a piece. Such machines are more at home in high-demand, commercialised business environments. Startups has created an overview of different photocopier prices, covering a spectrum of machines, ranging from the home-office copy buddy, to the high-end copy giants. Looking for a way around the steep prices for photocopying gear? Have you considered leasing a photocopier instead of buying one outright? If so, take a look at the Startups page on photocopier leasing. Otherwise, take into consideration that second-hand photocopiers will also be available for a approximately half of the retail price. However, a photocopier’s lifespan is typically five to ten years so don’t invest in kit that’s going to become outdated within six months. Note: photocopiers have scan-memory, so if you you’re dealing with sensitive information and decide to sell your copier, be sure to wipe its memory first. The above table is a condensed snapshot of what you might expect to pay for a good quality photocopier. If you’d like a more comprehensive breakdown, be sure to pay a visit to our best business photocopiers page, on which you can find cost comparisons, detailed colour photocopier price lists and a handy breakdown of model pros and cons. These days, modern high-end photocopiers can do all but the washing up. 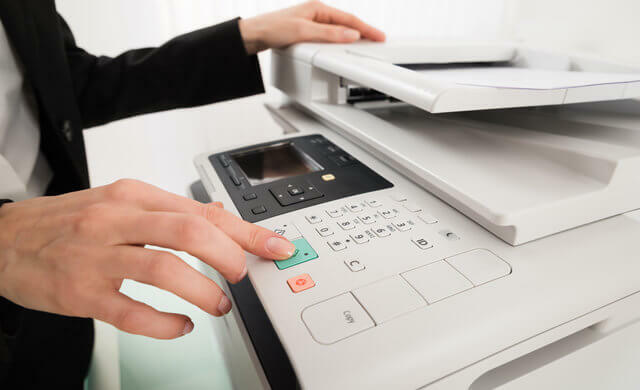 With features such as: scanning, automatic binding, automatic stapling, image editing, faxing and emailing available, it’s important to consider what exactly you’re looking for in a photocopier. Otherwise, you might end up investing in some fancy-pants technology from which you struggle to get your money’s worth. Another key consideration is: do you need a colour or a black and white photocopier? Black and white photocopiers are less expensive, firstly because you only have to buy one toner, secondly because the technology involved is slightly less complex. You can therefore expect a more costly colour photocopy machine price tag to be attached to a colour-capable machine. Basically, the more you require your machine to do, the more it’s going to cost, and if you want a colour photocopier, you’ll also be paying more in toner cartridges and other associated costs in the future. It’s important to be aware of the bigger picture when looking to buy a photocopier. Initial costs often aren’t the entire story, because photocopiers are high maintenance machines with big technological demands. Note: your photocopier will inevitably require further ad-hoc services and maintenance jobs that won’t be cheap. Also, photocopiers are very energy intensive machines, so your electricity bill is a very worthy consideration when making an investment. 40 to 300 Watts when on standby to keep the rollers hot. So, for an hour’s worth of copying at full energy consumption, it’ll cost your business £23.11p in energy bills. Photocopiers: to buy or to lease? The all important question when it comes to photocopiers is whether you buy or lease your machine. Buying one outright will ultimately give you complete autonomy as far as pricy office equipment is concerned, but will also require you to make a hefty initial investment. Then again, owning your own photocopier means that you aren’t tied into a contract and you’re free to do what you like with it. Leasing, often considered the more affordable option, could give you access to otherwise unaffordable kit, but is somewhat of a false economy in the long-run. This is because you’ll probably end up paying more in leasing fees over the years than you would have spent on the photocopier in the first place. Photocopier servicing can cost upwards of £100 a time – this is a significant cost and it might be worth looking into whether or not your supplier offers a service plan alongside the price of your chosen copier. Note: Leasing a copier will usually include any servicing and maintenance included in your lease price. Note: the above costs are dependent on the size, age and type of machine, and are judged according to the average A4, 80 gsm piece of white office paper. When it comes to leasing, the smaller, low-density machines come in at around £25 a month to lease. Right up at the other end of the scale, you could be looking at several hundred pounds a month for a super flashy photocopier. For more information on leasing a photocopier and the small-business benefits it has, have a read of the Startups page on photocopier leasing. Whether you make the choice to lease or to buy a photocopier, it’s a business investment that’s worth your time and consideration to make sure you’re getting the right one for you. Remember to think about how much copying your office realistically does, how much space you have, what standard you need your copying to be at and what your manageable budget is. For more information, read the Startups guide to the best business photocopiers, or, fill in the form at the top of this page to speak to suppliers and receive tailored quotes today.